"What would be the effect of different lubricants mixing together in a machine, e.g., hydraulic oil mixing with gear oil or oil and grease mixing?" Mixing lubricants of the same type but different viscosities will obviously have an impact on the viscosity of the lubricant within the asset. The final viscosity will be variable and based on the viscosities of the fluids that are mixed and on the quantities in which they are mixed. The lubricant's viscosity is selected based on a particular film thickness. This film provides the separation between the rolling and stationary elements in a bearing. The factors that affect this film thickness are the speed of rotation, the load placed on the shaft and the viscosity of the fluid. If the final viscosity of the mixed fluids is too low, the resulting film thickness will not be sufficient to provide adequate separation of the two bearing elements, which likely will lead to failure. If the viscosity is too high, increased energy consumption and heat generation can result. Imagine running in water on the beach. Water has a viscosity of 1. As the viscosity increases, it will take more effort to run through that water. Different types of lubricants are formulated with specific properties to compensate for the requirements of a particular type of machine. 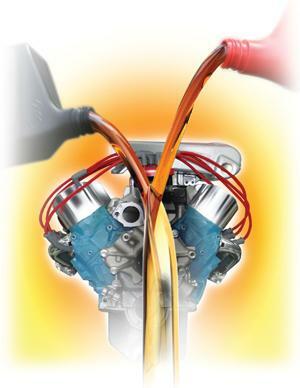 For example, gear oil may include a sulfur-phosphorus extreme-pressure (EP) additive. This is suitable for nearly every type of gear with the exception of a worm gear configuration. Generally, the bull gear in a worm gear configuration is made of a brass or bronze material. The sulfur-phosphorus EP additive is too aggressive, and due to the length of contact between the teeth of the bull and worm gears, more than enough heat and pressure are generated to activate the EP additive and cause it to attack the softer yellow metal of the bull gear. Rather than the ductile metal soap that offers additional EP protection, the result is corrosion. In many cases, hydraulic fluids have anti-wear (AW) additives instead of EP additives. These AW additives are not as chemically aggressive and thus will not provide the same level of protection as an EP additive. An additional concern is that hydraulic fluids normally have a much lower viscosity than gear oils. To understand what happens when oil and grease mix, you must consider the grease manufacturing process. A grease's thickener is made first, and then oil is added to achieve the desired grade. Therefore, mixing oil and grease will change the ratio of the base oil to the thickener, resulting in a lower consistency grade. Combine this with the issues of viscosity and oil incompatibility and you have a recipe for disaster when lubricants are mixed.